Reactions to Numbers 1–5 were wonderful. All kinds of incredible “numbers” have been put up by those who have worn pinstripes through the many decades the team from the Bronx has been playing baseball. Some of these numbers spark memories, controversy, wonder. Enjoy. Send along your own suggestions. On June 6, 1934 Yankee outfielder Myril Hoag tied an American League record with six singles in six at-bats. The 1939 Yankees led by 24-year-old Joe DiMaggio averaged an amazing 6.4 runs per game as a team. Hall of Fame manager Leo Durocher, an infielder in 1929, was the first Yankee to wear No. 7. Bob Costas was seven years old when he went to the Stadium for the first time. He saw the Yankees play the Orioles. He visited the monuments to Ruth and Gehrig in centerfield. He claimed he cried, thinking old Yankee greats were buried there. Mickey Mantle’s number, retired June 8, 1969. He wore it from 1951 on. Mel Allen was the first announcer to broadcast Major League Baseball games over seven decades. His tenure ran from Lou Gehrig to Don Mattingly. In 1982, Graig Nettles became seventh Captain in Yankee history. Record held by Lou Gehrig, most seasons leading league games played. Only number to be retired twice by the same team is Number 8 of the Yankees. It was retired in 1972 for catchers Bill Dickey and Yogi Berra. Berra took number 8 in 1948 after Dickey retired but before he was a coach. Dwight Gooden’s no-hitter on May 14, 1996, the eighth in Stadium history. Roger Maris’ number, retired, July 13, 1985. The 1990 Yankees had but one starting pitcher who won more than seven games, nine-game winner Tim Leary; he also lost 19. Most hits in an inning given up by Roger Clemens, August 2, 2007. The most .300 hitters in the 1930 season. The most shutouts in a season: Ron Guidry, 1978. Graig Nettles was the last Yankee to wear No. 9 before it was retired. Of Babe Ruth’s 714 career home runs, 10 were inside-the-parkers. Ruth hit 10 career home runs off the great Walter Johnson. No other player hit more than 5 the star hurler in his 21-year career. With the Yankees from 1920 to 1934, the “Colussus of Clout” won 10 home run titles. The record number of pinch hitters on September 6, 1954 Yankees used in doubleheader against the Boston Red Sox. Casey Stengel managed in a record 10 World Series, winning 7 of them. The Yanks used a record 10 pinch hitters on September 6, 1954 in a doubleheader against the Boston Red Sox. They won the opener 6–5, and the BoSox took the second game, 8–7. Wins by Whitey Ford in World Series. Phil Rizzuto’s number 10 retired August 4, 1985. Yogi Berra leads all with 10 World Series rings. 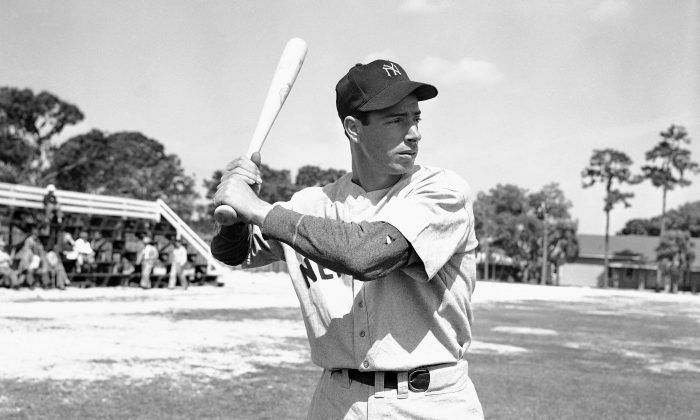 Joe DiMaggio was second with 9. Alex Rodriguez in 2007 became the first player in major league history with 10 straight seasons of at least 35 homers, 100 RBIs and 100 runs scored. Dr. Harvey Frommer, a professor at Dartmouth College in the MALS program, is in his 40th year of writing books. A noted oral historian and sports journalist, he is the author of 42 sports books including the classics: best-selling “New York City Baseball, 1947-1957″ and best-selling Shoeless Joe and Ragtime Baseball, as well as his acclaimed Remembering Yankee Stadium and best-selling Remembering Fenway Park. His highly praised When It Was Just a Game: Remembering the First Super Bowl was published last fall.